First off, Happy Independence Day everyone! I hope everyone had an outstanding day celebrating our country's birthday. The blasts of the fireworks and the foams of the brews, plus great family atmospheres and baseball make this a very special holiday every Fourth of July. The time has come where the rumors are swirling about who is going where after the All-Star break and into the coming days of the approaching trade deadline. One of the most prized possessions during the break will be Zack Greinke of the Milwaukee Brewers. That is, if the Brewers decide to become sellers. These next two weeks will be the deciding factor on whether or not Milwaukee wheel and deals, or if they look to upgrade to try for the postseason. Zack Greinke pitching at Great American Ballpark as Rangers and Yankees scouts look on in attendance. Before I get into the who, what, where, when, and why's, here's my honest opinion on what I feel needs to happen at this point. The Brewers have a great opportunity to move up in the division in the next few days. They finish up the series with the Marlins tomorrow. They then head to Houston for three games before the All-Star break. After the break, the play the Pirates in a three game series at home and the Reds in a three game series on the road. The organization itself, as well as the fans will know if we will start making some moves or not. So, I'm sure you want me to answer the million dollar question at this point. "Will the Brewers trade Zack and do you think it's the right move?" Yes, and yes. Now, let me emphasize. I do believe the Brewers will trade Zack Greinke, if the offer is right. So, I guess the second part of the question relies a lot on the first part. If the offer isn't what Mark A and Doug see as what Greinke is worth, then I don't see a deal happening. Will the Brewers make other moves besides Zack? Yes, almost guaranteed. But, Doug will be getting the most calls about Zack before anyone else. Oh, and he's not an All-Star. So, what is the right price for a guy like Zack Greinke? I think a deal similar to what we sent Kansas City is more then fair for Zack. Basically, Zack is worth about two to three major league ready players and one to two prospects. I do believe Doug will take a cut from what I think he's worth. I see us acquiring more prospects then major league ready guys. I will take a look at the Top 5 teams that have been linked to the Zack trade rumors, in order of relevance I see of possible places he could go. Many sources are indicating that the Yankees are least likely to grab him, only because they would more then likely use Greinke in a non-starter role, due to their concern over how he would adjust to New York. The Yankees, who have most of their more talented prospects in the lower minors, would line up well with the Cubs, who have an eye toward the future, rather then the Brewers who are looking for prospects a bit higher then that level that are near ready if not fully ready for the majors. The Yankees have sent scouts to watch Zack, but that doesn't mean much. Simply put, it wouldn't be a trade deadline without the Yankees getting their name in there. Also, Zack wants to be a starter, plain and simple. Minus the relief pitchers, the Yankees really don't have much to offer Milwaukee. And, anyone on their main roster would be totally out of the question because of the contracts they all have. Yankees, to me at least, will be out of these talks before they ever really get involved. The Blue Jays are in some trouble for their starting rotation for the remainder of the season. One good thing about this idea of Zack going to Toronto is that the Brewers have already sent scouts to watch a few of their minor leaguers and also, 1B Adam Lind. Again, doesn't mean much but we have interest. If Milwaukee is forced to trade their ace, they will most likely be looking for a package of players including a pitching prospect, but more importantly, a shortstop. The Blue Jays are unlikely to part with their current shortstop, Yunel Escobar, and their current Triple-A shortstop, Adeiny Hechavarria, might be too valuable a bargaining chip for Alex Anthopolous to part with. Again, the Brewers would love the pitching, but they are also looking for a corner infielder with a bat. If you are wondering where Hechavarria is, he is No. 17 on their prospect list, which shows he's far from being ready for the Bigs. His glove is there, his bat is no where near. Still, I would love to have Adeiny in our organization. Now, you may say, "That isn't that bad, it's only one guy." Well, yes, it's one guy. The one guy who had the lowest ERA (1.99) in all of baseball before his season ended. The current starting rotation has a combined ERA of 4.69. So there is reason to believe the Braves would be looking to add onto their rotation with a guy like Zack. Mike Minor has the highest ERA of 6.20 ERA, and he would likely be the odd man out if Zack were to arrive in Atlanta. It's also worth noting that the Braves might back out of these trade talks if their newly signed "blast from the Brewers' past" Ben Sheets can show signs of life in the Braves minor league system. The Braves sit in the middle of the pack in the National League East divisional race. Zack could put them over the edge to get them above the Nationals and Mets. One word decribes that Top 5...yummy. I doubt the Braves would give up Teheran, but stranger things have been known to happen. So you move down to the No. 2 thru No. 4 spots. Vizcaino is in the Braves bullpen(on 15 Day DL currently), Delgado is currently in the Braves rotation, and Simmons is currently starting at SS for the Braves. Losing Simmons would hurt Atlanta a lot, but they do have veteran Jack Wilson and Tyler Pastornicky in the minors. That doesn;t say much. Young, but major league ready is written all over the Braves. I think if the Brewers are going to deal Zack, they will be staring at the phone hoping Atlanta rings. With the possibility of having an entire new rotation new season, the Brewers not only have to look at relief pitching, but replenishing starters as well. Miller, Martinez, and Jenkins would do that for Milwaukee. These three gentlemen are a few years out of pitching in the Bigs, if not ready for 2013. Then you move to Wong, who has somewhat of a cult following in St. Louis, much like how Scooter Gennett is developing here in Milwaukee. Now, with the struggles we are seeing with Weeks, it may not be a bad idea to have a back up plan set in stone. You could honestly run down the Cardinals Top 20 list of prospects and get decent guys, well enough for a Greinke trade. Why they need him - Neftali Feliz on the 60 Day DL (sprained ligament in right elbow), Derek Holland on the 15 Day DL (left shoulder, elbow fatigue), Colby Lewis on the 15 Day DL (right forearm tendinitis), Alexi Ogando on the 15 Day DL (groin strain). What makes me confident that IF a deal happens for Zack, it will be with Texas because they are scouting Zack AND we are scouting their minors. We have been to their Double-A affiliate on more then one occasion. They have watched Greinke's last two starts. Not to mention, Darvish and Harrison are the only two starters in the rotation that were there for opening day. Combine that with losing C.J Wilson in the offseason to free agency, they have holes to fill at the moment to stay ahead of the Angels, who are slowly creeping up. Much like the Cardinals, the Rangers are LOADED with prospects. I know, I know...Jurickson Profar's name is sticking out like a sore thumb. Let me break it to you guys; it's going to be next to impossible for the Rangers to give up Profar. Yes, they have 23 year old Elvis Andrus who is signed until 2014. Maybe they trade Andrus? Who knows. I guy to look at is Mike Olt, who is a monster hitter and corner infielder. down the list of prospects for the Rangers, about half are pitchers, too. I see the Rangers having the most ingredients to offer Milwaukee for this potential blockbuster trade. Arizona Diamondbacks - They lost Daniel Hudson for the year, so they may be looking to upgrade their rotation if they think they can catch the Giants and Dodgers. Their prospects aren't the best, but not the worst. They would probably have to send some main roster guys to Milwaukee. Washington Nationals - They can taste it, and it's only the All-Star break. However, they will be shutting down Stephen Strasburg down at some point this year. Now, if they make the postseason, they might activate him. Who knows. But, with that and the combination of Wang being on the DL, the Nationals may be looking to go all out. They have decent prospects to offer Milwaukee. Boston Red Sox - Why not? Real simple here: They are injured, they need help, but they have as many decent prospects as the Expos do. Only way they would get Zack from us is if a third team were involved. To finish up, teams like Orioles, Angels, and Dodgers will be calling as well, but I see them all trying to low ball the Brewers. 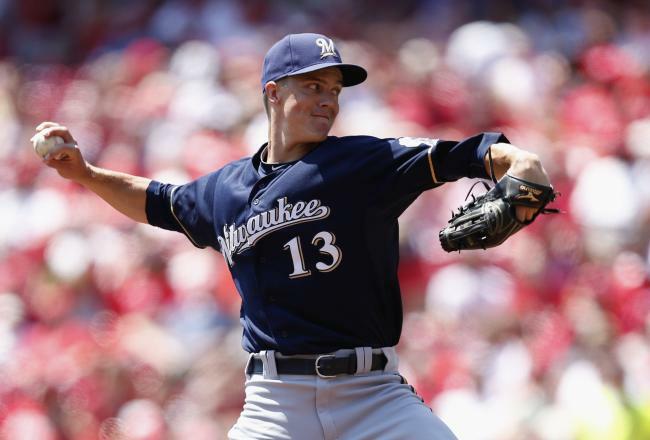 Bottomline, I want the Brewers to trade Greinke if the deal is right. I don't want to feel sick when I read the names of people we potentially will acquire.